Part 23 of 31 in our NHL previews where Ballantyne, Waind and I rank each NHL team 1 through 31 and give you an outlook on their season. Starting from the worst, we’ll be giving you the reasons why we ranked each team where we did. The Blue Jackets were one of the most surprising teams in the NHL last season. Just a year removed from a 76 point season and finishing at the bottom of the Metropolitan Division, the Jackets completely turned their team around with an impressive 2016-17 season, a season that included an impressive 16-game winning streak. While a large part of the turnaround had to do with Sergei Bobrovsky’s Vezina-winning form, you can’t overlook the rest of this team. Cam Atkinson had his best season to date registering 62 points (35 goals, 27 assists) which lead the team. The Blue Jackets were hoping for a rookie to actually contribute, and it finally happened, just not the guy they were expecting. Rather than seeing 2016 3rd overall pick Pierre-Luc Dubois step in, it was 2015 8th overall pick Zach Werenski who became a key piece of the Columbus blue line and found himself getting some Calder Trophy votes at the end of the season. The Blue Jackets defensemen have now become a strength of this team, with Werenski and Seth Jones leading the way. The two combined for 89 points last season (Werenski had 47, Jones with 42), and became important pieces of the special teams units as well. Not to mention the Blue Jackets already have Jack Johnson, and former 2nd overall pick Ryan Murray who has been bumped down to the third pair. The Jackets blue line is deep, making life much easier for Bobrovsky. One of the biggest moves of this past offseason was the trade in which Columbus sent Brandon Saad, Anton Forsberg and a 5th round pick in 2018 to the Blackhawks in exchange for Artemi Panarin, Tyler Motte, and a 6th round pick in 2017 (used to select Jonathan Davidsson). Entering his third season, Panarin has already proven himself to be an elite scorer in the NHL and could be the missing piece that Columbus needs to compete with the other powerhouse teams in their division. The Blue Jackets lost more players than they picked up, freeing some space for their prospects to step in. This means that Dubois and Sonny Milano are going to get their chance to play in the show, and so far it’s been paying off, specifically with Milano. The 21 year started the season hot, and after 8 games he’s scored 5 times. Despite his goal scoring he’s yet to record an assist this season, with the only knock on his game is that he needs to learn to play without the puck. As we’ve seen before, the success of this team relies on how well Bobrovsky can play. Last season he won his second Vezina Trophy, posting a 2.06 GAA and .931 SV% to go along with a 41-17-5 record and 7 shutouts. The Blue Jackets are no longer a surprise team, they’re expected to be one of the top teams in the league. Going forward into the new season, a lot of their success will depend on how well they can handle this kind of pressure, but with a roster made up of both young players and some talented veterans, the Jackets are looking at another strong season, just hopefully not a playoff matchup with the Penguins again. The newest member of the Blue Jackets is also the most important. What Panarin brings to this team is a dynamic offensive threat, capable of both finding the back of the net and setting up his teammates with ease. While he only has two seasons of play for us to judge, what we’ve seen is impressive to say the least. The 2016 Calder winner has 160 points in 170 career games, including 9 already this season (1 goal, 8 assists). 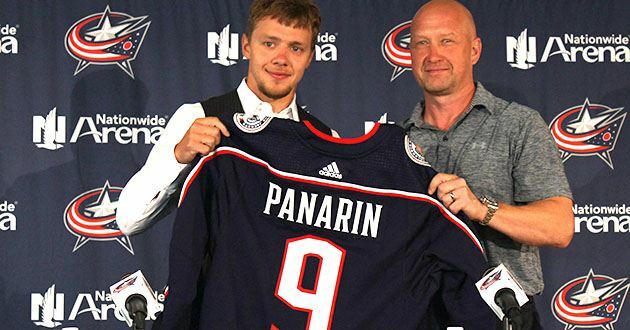 On that doesn’t rely solely on one player to score every game, the addition of Panarin is bound to help the team improve on their 6th ranked offense from last season. Teams now have to prepare for Panarin, without overcommitting and leaving a Nick Foligno or Brandon Dubinksy open. Officer Bobrovsky has been on the case for Columbus, and is easily the strength of this team (despite what you might think based on some of the highlights from this video). Since coming to Columbus, Bob has won the Vezina twice, and is now viewed as one of the elite goalies in the NHL. Not only is he a workhorse for the Blue Jackets, starting 63 games last season, but he’s putting up some incredible stats while he’s at it. His goals against average and save percentage were the best in the league, while also ranking third in shutouts and fourth in saves made. His season was so good that even the other Vezina nominees were expecting him to win the award. It’s hard to spot a clear weakness on this team, but if anything it’s been their inconsistency over the last couple seasons. You can look at last year and see all of the reasons that they put together their best season in franchise history. But if you look to the season before, you see how many of the players that were on that terrible 2015-16 team are still there today. The fact that 2015-16 fell apart so badly after Bobrosvky got hurt shows just how important he is to this team. But it could also be a cause for concern if the injury bug bites this team again. Now, by adding some young players into the mix that element of maturity to overcome this type of adversity just isn’t there. We don’t know what these players can do, or how they’ll be able to fit in among the core group of players already established. The talent is there at every position, but just how much can we expect from one of the youngest teams in the NHL? If there’s anything Blue Jackets fans can look forward to, it’s that this team was the youngest in the NHL to start last season and still had the 4th best record in the league and the best since the Blue Jackets joined the NHL. It’s finally time for the Blue Jackets prospects to make the jump to the NHL. Dubois, Milano, Oliver Bjorkstrand and Gabriel Carlsson have already seen some action with the Blue Jackets this year, while Tyler Motte is likely the next player to make that jump from Cleveland to Columbus. After Werenski’s breakout season last year, and the NHL’s transition into a league designed for young, skilled players, the Blue Jackets are hoping more of their prospects can become impact players sooner rather than later. In this past Entry Draft, they added to this prospect pool by selecting Alexandre Texier with their first pick at 45th overall. The French prospect recored 19 points in 40 games with Grenoble during the regular season, but found another level and scored 10 in 12 games in the playoffs. Noted for his slick hands, he’s still a few years away from the NHL, but could be a bright spot for Columbus a few years down the line. While he might not get the kind of attention he deserves, Seth Jones is well on his way to becoming a superstar in the NHL. After John Tortorella forced Ryan Johansen out of Columbus, it left many people shaking their heads and trying to figure out just what was going on. Not to say Tortorella is a genius (because if you ask Tom he might be the worst coach ever), but looking back on it now you can say that maybe it made sense? The Blue Jackets scoring hasn’t suffered, and in return they got a top pair defenseman. In something that seems very rare in the NHL these days, both teams seem to be winners in this trade. The 23 year old is now in his fifth season in the NHL, but last year was a breakout season for the talented defenseman. Scoring 12 goals and adding 30 assists for a total of 42 points, Jones beat his previous best point total by 15 last year. Not only can he help in the offensive zone, but his defensive game has been improving as well. He’s a legitimate #1 defenseman, and if he was playing in a bigger market he’d be getting the recognition he deserves. Like I mentioned earlier, the Blue Jackets will be relying on Bobrovsky again this season. Even though it worked last year, there’s always that chance that he goes down with an injury, and at that point we could be talking about Columbus completely differently. But for now, this young team and franchise goalie have a promising season ahead. While topping last year could be tough, and they have the disadvantage of playing in the same division as Washington and Pittsburgh, the Blue Jackets are right and the edge of being a legit contender. All of the pieces are in place, now it’s just time to see what this group of young guns can do.